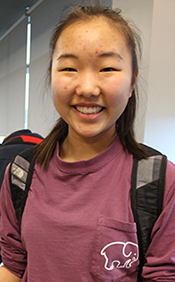 Tech Valley High School is proud to announce that sophomore Purevsuren Batdorj of Rensselaer won first place in the New York Future Problem Solving Program’s annual State Bowl in Long Island on March 12. Batdorj was awarded a trophy for her creative short story “A Child of Mali” in the “scenario writing” category of the senior division. Batdorj received an invitation to represent New York in the Future Problem Solving International Competition to be held at the University of Wisconsin, LaCrosse in early June. In order to win this prize, Batdorj wrote a futuristic short story on “Educational Disparities,” one of the topics of study in the program this year. At the International Conference, Batdorj will be challenged to work with three other scenario writers from around the world to collaboratively craft a short story in two hours on the topic of “Biosecurity.” Let’s wish her luck!